I picked up Forces of Warmachine: Mercenaries this weekend. I am relatively certain this will be the most popular of the Forces of… books, since most players will at least be interested in fielding a mercenary or two along the way, if not fielding an entire force of the money-grubbing bastiches. The fiction about MacBain (MacBain!) at the beginning was a rousing good read, though I have to say it unfolded in a way that I anticipated within the first few paragraphs. I’m sad that the Motherland is still an antagonist in the fiction, while the cursed Swans remain the nominal good guys. That said, I definitely liked the way the Kayayzy were depicted–I would have anticipated that in this book Croe’s Cutthroats would have been featured in that role, instead. The Charters I think I understood pretty well before the release of the book, so the most important new info here was the Tier Lists. The Tier List for pMagnus looks pretty strong, actually, as does that of MacBain. The only thing missing from Ashlynn’s list that I’d rather have is the Forgeguard, though I’d have to say the Precursor Knights look like a better unit than I had initially appraised them to be. I have little to no interest in playing any of the Pirates (despite the fact that I’d choose Pirate over Ninja, typically), and their Tier Lists seemed to be not very nunaced one from another in a way that I could make sense of. The background fluff on the contracts and the various Mercenary factions was interesting, to be sure. I wish I was more versed in the world of Immoren, but at this point I am awaiting the reboot of the roleplaying game before I learn more of the broad history of the Iron Kingdoms. The character stories for the individual entries were entertaining, and even got me interested in a few units I might have otherwise overlooked, such as Alexia Ciannor. I particularly liked the fact that Eiryss’ entries were rewritten for the context of the Mercenaries book, and refer obliquely to her “mysterious motives”, rather than her explicit motives as revealed in the Retribution book. The art throughout was mostly just alright, I’d say: I didn’t see much that excited me in particular, unlike the other Forces of… books, which all had numerous pieces to linger over. I think my favorite piece was actually the illustration for the Nyss Hunters entry, though the Horgenhold Forge Guard was a close second, followed by the fantastic illustration of the Piper of Ord with his English-Civil-War-era Van Dyck. I found the illustration for the Ghordson Basher to be rather poor, to be honest, and I was rather dissatisfied by how many of the solos, especially, were literal depictions of the models’ poses. In addition, Kell Bailoch’s illustration is a paint-over of a photograph, and is such a significant departure from the overall art direction that I wonder what the behind-the-scenes story might have been. Still, in such a large book, with a wide variety of characters and unit types, and in the face of the overall task of creating and illustrating a large number of Forces of… books for Warmachine and Hordes, I am certain it is difficult to maintain consistent styles and consistent levels of creativity. I know I have spent a lot of time wrangling concept art from internal and external sources in my career, and it is a big task. Overall, the most surprising thing for me was that the book cemented my decision to field a Khador force. While I get energized about playing the faction every time I read the Khador book, I get more energized about individual models or units while reading the Mercenaries book. Last week I ordered some 25mm square desert bases for my Wild West figures from Dragon Forge Design, and they arrived today. I had contacted the maker to see if he could mix and match from a couple different series, but he said he wasn’t able to do so since he makes entire sets at a time, which I had anticipated. 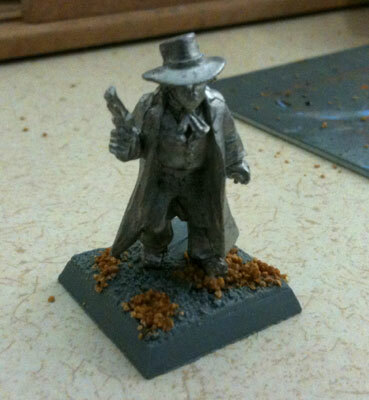 I’ll order a different set if I ever buy more Wild West minis. The sculpting is very detailed, and the resin and casting seem to be high quality, with no bubbles, cracks, or striations. 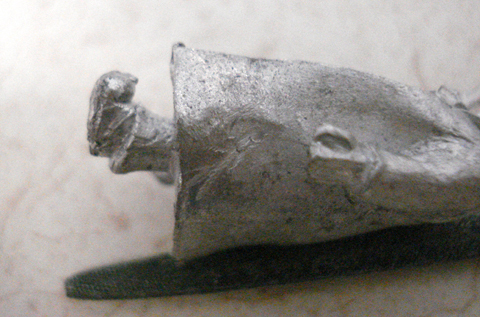 There was some heavy flashing on a couple pieces, but it came off cleanly with an hobby knife. 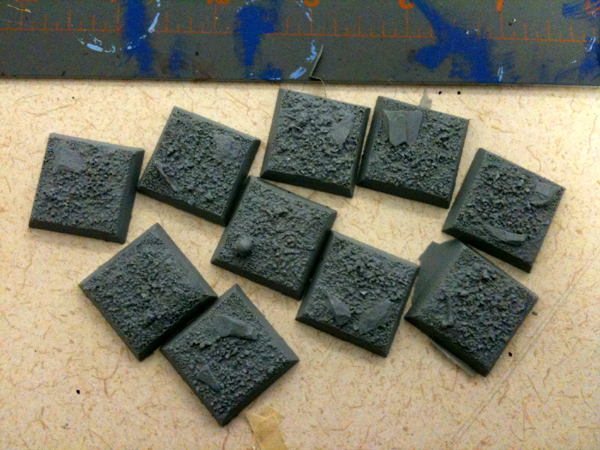 I didn’t really want the skull and bones on the bases, so I might grind them off with the Un-Dremel and cover the damage with gravel or grass, since it seems a little too “fantasy” for historical minis. I drilled a hole for the figure I removed from its base, and added some Gale Force 9 sand to fill in the gaps around his foot and add some extra texture variation. I’ll prime the figure and base next weekend, though I just realized I forgot to wash the resin, sigh.